Hello, this is my very first blog ever. To say I am scared to write down my thoughts would be an understatement. But a friend who I really hadn’t spoken to in years advised me to write, so here I am putting it out there for you to read. I have actually thought about writing a lot. 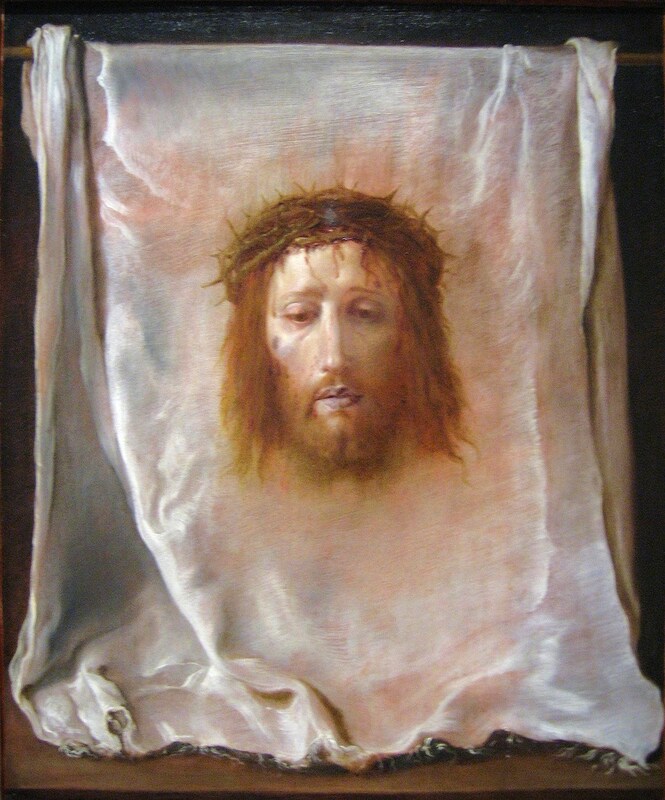 I named my first blog post, “Wiping the Face of Jesus,” and my site, “Veil of Veronica” and many of you may think those are strange names, so for my first blog I will explain my choice of blog names. If you know me at all you know that I am Catholic. I identify myself as this above all things. It is who I am, a believer in Jesus Christ and a member of the Catholic Church. If you have known me a long time, you already knew this about me. I have grown up going to church, attended Catholic schools, and generally been involved in Church activities or teaching in some way shape or form all of my life. In 2010 though, I had an awakening, a conversion within a conversion, if you will. If you knew me before then, you would have said, she is a good Christian girl. I was going through the motions doing what was asked. But, looking back now, I was missing so much. You see, I had a friend, and her name was Veronica. Veronica was sweet and beautiful and genuinely a kind person. My son was her son’s best friend. We were not the best of friends but we were friends that genuinely liked each other and we were mother’s who loved our children, and who hung out together because our boys brought us together. On August 28, 2010, Veronica called me and asked if my son could spend the night at her house. Though I had allowed him to dozens of times before, that night for some reason, I was uneasy. I told her no, but that he could come over and play for the afternoon and that I would pick him up before dinner. Around 4 o’clock I drove out to her house to pick him up. I stood in Veronica’s kitchen area and we chatted about our boys. She told me how each of them had a gift and what special children they were. She had taken them to the grocery store to buy their favorite ice cream to eat. My son also wanted cereal which she generously bought for him and gave me to take home for him. I thanked her and I drove away. So Lord, “what can I do?” He told me that the only person I could control was myself. That I can choose to love and spread that love outward. For me this meant examining my own conscience and trying to become a better person. Did I love my enemy? or even my neighbor, for that matter? The answer was a resounding, NO. Oh my, I thought, I have not always spread love and left people better off for knowing me. In the Catholic Church, we have confession, where we go to a Priest and confess our sins. I had always disliked this Sacrament and dreaded going. But here, in this place, crying on the ground, I found it to be a gift. A gift I was grateful for. In telling my sins, I was able to encounter Christ. I had a confession like I had never had before. In this Sacrament, I received the grace that Jesus offers to us when we choose to ask for it. I took a good hard look at myself and my selfishness started to burn away because of the love I encountered in confessing. The Sacrament makes me try to do better, and though I know that I am a sinner and will continue to have failures, I can receive His sanctifying grace and forgiveness when I go. This helps me to spread His goodness forward. I don’t think you have to be Catholic to understand this. Her murder was not my fault, but I would not let her murder be in vain, I would not let her life be snuffed out without letting others know the impact it had on me, and that good could come out of the ashes of such awful circumstances. Thus my journey toward being truly Christian began. I thought of Veronica. In Catholicism while Jesus is in His Passion, walking His way to Golgotha, bloodied and beaten, He comes across a woman named Veronica. Veronica wipes the face of Jesus. A small kindness. This man, this God man, was bloodied, beaten, tired, in agony, and this women, Veronica, provided a brief respite, if you will. A few seconds where the sweat and blood were wiped away, and for a moment, however brief, He felt love from this woman. It did not stop His Passion, His suffering, but in a world that was mocking Him, scourging Him, that woman’s touch with the cloth must have felt glorious. So He imprinted His image on her cloth. Veronica, means “True Image”. He left her the mark of His love. And so because of my friend, Veronica, who also had provided me love and respite during a tough time in my life, I must spread love and kindness where ever I go. I cannot stop suffering, but I can offer that respite to those who are lost, poor, lonely, unwanted, or unloved. And so for me, I will wipe the Face of Jesus, as long as His grace and mercy allows me to. This entry was posted in Uncategorized and tagged Confession, love, Repentance, Sin, Transformation. Bookmark the permalink. I will try to find out what is going on. folks think about concerns that they plainly don’t recognize about. note how they create news headlines to grab viewers to click. get readers excited about what you’ve written. whoah this blog is magnificent i like studying your posts. Keep up the great paintings! You understand, many people are searching around for this information, you can help them greatly. so very inspiring! God Bless! in 2007 I lost a beloved friend to suicide, miss him so very much. It was such a terribly sad time for me, prayed intensely and had many people praying intensely for his soul… when subsequently the evil one made himself known to me, attacking me with the utmost “hate”, I took this as a sign that my friend had been saved, a soul snatched from the evil ones grip! Praise God! I am so sorry for the loss of your friend and yes you probably made the devil mad. If you say a Divine Mercy for someone who has died in the past because God is outside of time he can take the graces from your prayer to the person at the time of their death. I learned that from Divine Mercy 101 with Father Chris Alar. Our God is so good! !